Have you ever experienced a moment where you thought, “My entire life has lead up to this”? For many people, walking down the aisle to the love of their life or seeing the face of their newborn baby surely fits the bill. Well, I recently experienced this phenomenon at 2:35pm on Thursday, February 28th in front of the Tiger Kingdom in Chiang Mai, Thailand. Inside the gates were nearly 50 tigers ranging from several weeks to full-grown and I was allowed to touch them, play with them, become best friends with them. This was happening. Kiera, Matt (my friend who is joining in on the fun for three weeks), and I splurged on the all-five enclosures package that came with three CDs of professional photos. The grand total: $45. A small price to pay for your dreams, people. From the first giddy moments as a tiger cub leapt across my lap to the last goodbye stroke given to a 400 pound male, my heart was racing and adrenaline pumping. This took my love of cats to a whole new level. We staged hundreds of photographs—me “pulling” a tiger’s tail, all of us crossing our eyes to make fun of one particularly goofy fellow, Beatrice keeping the attention of one doll-crazed feline—and eked out the maximum amount of time per enclosure. The cats were quite active throughout, and while they have been hand-raised to interact with humans, there was an obvious sense of danger to the whole thing. I kept hoping for a quick swat to the arm that would leave an awesomely cool scar, but alas, they were too well behaved. You’re more likely to get scratched by Kiera’s cat (Teddy) than these beasts. Tiger Kingdom and other similar facilities are often under scrutiny for a variety of reasons. 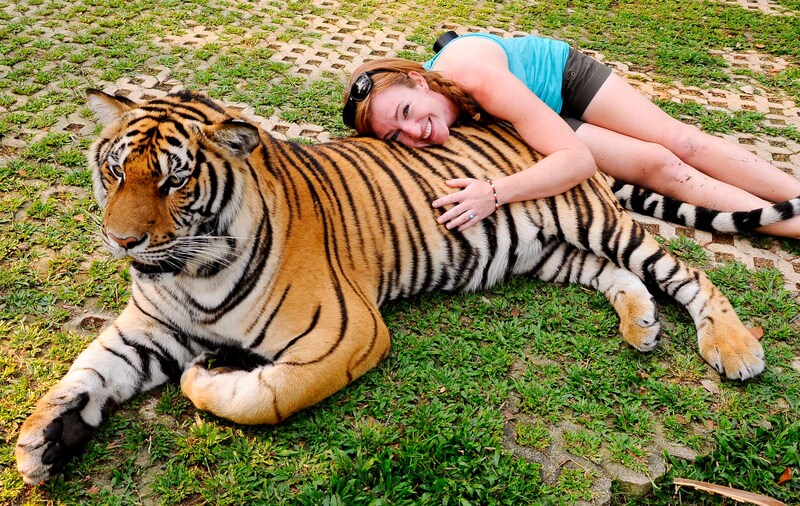 I did quite a bit of research before deciding to visit, and while cases of neglect and abuse have been reported at other places, Tiger Kingdom has a reputation of being impeccably clean and does not sedate the cats. Unfortunately, the goal of the breeding program is not to reintroduce tigers to the wild but to provide them to zoos and other “educational facilities.” How much education is truly occurring is up for debate. But in the end, here is how I see it. Are the tigers being harmed by those working at the facility? No. Is the caged environment ideal for the tigers? No. Is it better to have tigers in this type of captivity versus not having tigers at all? Yes. Poaching continues to be a huge problem for wild tigers (there only an estimated 350 Indochinese tigers remaining) and a captive breeding facility helps to keep the species alive until larger-scale environmental and educational developments are made. There are ways that we can help support this effort, such as adopting a tiger through the World Wildlife Fund or following any of the suggestions presented by the “Save Tigers Now” campaign. I hope that you’ll join me in supporting this cause, and in return, I will gladly send you a photo of our glorious “tiger cub spoon train.” It truly was, one of the best days of my life.